ජනාධිපතිවරණයක් වීමේ විශාල ඉඩක් තිබෙන නමුත් මේ දවස්වල දයාසිරි ජයසේකර මහතාගේ ප්‍රකාශ දෙස බලද්දී පෙනී යන්නේ සමහර විට මහ මැතිවරණයක් මුලින් පැමිණීමේ ඉඩක්ද පවතින බවයි. ඒ කුමන මැතිවරණය මුලින් පැමිණියත් අපට ස්ථිර වශයෙන්ම පෙන්නුම් කෙරෙන කාරණයක් වන්නේ මීළඟ බක් මහට පෙර රටේ පාලනය ගැන තීරණයක් ගැනීමේ ඉඩක් ජනතාවට ලැබෙන්නට නියමිත බවයි. ඒ කියන්නේ අපේ රටේ පාලනය සඳහා අලුත් කණ්ඩායමක් පත් කරනවාද එසේත් නැතිනම් මේ ආණ්ඩුවම දිගටම තියා ගන්නවාද කියන කාරණය තීරණය කරන්නට අවස්ථාවක් මීළඟ අලුත් අවුරුද්දට කලින් උදාවෙන බවයි. 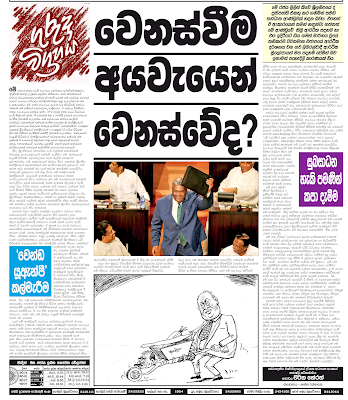 මේ ආණ්ඩුවේ ප්‍රධානීන් 2015 පසුව කවදාවත් නියමිත ඡන්දයක් නියමිත දිනයට පැවැත්වූයේ නැති නිසා මීළඟ බක්මහට පෙර මහ ඡන්දයක් හෝ ජනාධිපතිවරණයක් පැවැත්වෙනු ඇතැයි කියද්දී සමහරුන් තවමත් ඒ දෙස බලන්නේ සැකයකින්ය. බරපතළ විචිකිච්ඡාවකින්ය. මෙවර සටහනින් සාකච්ජා කරන්නට බලාපොරොත්තු වන්නේ අපේ රටේ දේශපාලනය වර්තමානයේ මුහුණදෙන බරපතළ කාරණයක් පිළිබඳව වන ජනතාවට වගවන මන්ත්‍රීවරයකු නිර්මාණය කර ගැනීමේ අභියෝගය පිළිබඳවය. වෙනත් ලෙසකින් පවසතොත් උත්සාහ කරන්නේ ‘නියෝජිත ප්‍රජාතන්ත්‍රවාදය’ (Representative Democracy) ලෙසින් හඳුන්වන අපේ රටේ පාර්ලිමේන්තු ක්‍රමය වර්තමානයේ මුහුණ දෙන බරපතළ අර්බුදයක් පිළිබඳව සාකච්ජා කරන්නටය. මෙහිදී අපගේ අවධානයට ලක්විය යුතු කරුණු කීපයක්ම තිබුණත් ඒවා කථා කරන්නට පෙර මේ ක්‍රමය අද මුහුණ දෙන අර්බුදයේ තත්ත්වය පෙන්නුම් කරන සිදුවීමක් දෙකක් අපගේ මතකයට ගැනීම ඉතාමත් වැදගත්ය. මාගේ අවධානයට ලක් වූ එක් සිද්ධියක් වන්නේ මේ දවස්වල ෆේස් බුක් සමාජ මාධ්‍යයේ බරපතළ ලෙස ප්‍රචාරණය වූ මහනුවර දේශපාලනඥයකු හා ස්වාමීන් වහන්සේ නමක් අතර වූ දුරකතන සංවාදය පිළිබඳවය. සමාජ මාධ්‍යවල ඉතාමත් වේගයකින් ප්‍රචාරණය වූ එම ප්‍රවෘත්තිය වූයේ මහා මාර්ග සංවර්ධනය පිළිබඳව වූ ගැටලුවක් මුල්කර ගනිමින් මහනුවර දිස්ත්‍රික්කයේ සිදුකරන ලද උද්ඝෝෂණයක් අතර තුර එම උද්ඝෝෂණයේ මූලිකත්වයක් ගෙන සිටි ස්වාමීන් වහන්සේ නමක් අදාළ දේශපාලන ප්‍රධානියාට දුරකථනයෙන් කථා කරන අවස්ථාවක්ය. ඒ උද්ඝෝෂණ භූමියේ සිටින අතරම තමන්ගේ උද්ඝෝෂණයට හේතු වූ කාරණය දේශපාලකයාට (ඊට සම්බන්ධ ඇමැතිවරයාට) කියන්නට දුරකථන පණිවිඩයක් ලබාදෙන ස්වාමීන් වහන්සේට ඇමැතිවරයා අමතන්නේ ‘පර බල්ලා’ වැනි ඉතාමත් පහත් භාෂා ව්‍යවහාරයකින්ය. පසුව ඒ ඇමැතිවරයාගේ අත්සනින්ම නිකුත් වූ නිවේදනයකින් ඔහු කියා සිටියේ තමන් එසේ ‘බලූ‘ ආමන්ත්‍රණයෙන් ඇමතුවේ දුරකතනයේ එහා කොනේ සිටින්නේ ස්වාමීන් වහන්සේ නමක් බව නොදැන බවත් තමන් සිතා සිටියේ උද්ඝෝෂණයේ සිටින ඡන්දදායකයකු විසින් තමාට දුරකතනයෙන් අමතන බවත් යැයි කියාය. ඇමැතිවරයාගේ පළමු ප්‍රකාශය මෙන්ම මේ නිල වශයෙන්ම නිකුත් කළ දෙවන ප්‍රකාශයෙන් ද පෙන්නුම් කරන්නේ මේ රටේ වර්තමාන දේශපාලනයේ යෙදී සිටින ‘මහජන නියෝජිතයා’ තමන් විසින් නියෝජනය කරන ප්‍රධාන ජනප්‍රවාහය පිළිබඳව සිතා සිටින මට්ටමේ ස්වභාවයේ තරමය. අනෙක් අතට ඔහු සමාජයට නොකියා කියන්නේ එක්කෝ තමන් නියෝජනය කරන්නේ මහජනයා නොව වෙනත් සතුන් සමූහයක් යැයි කියාය එසේත් නැතිනම් ඔහු කියන්නේ මහජනතාව යනු තමන් පාර්ලිමේන්තුවට පත් කර එවන කල් පමණක් සිටින කණ්ඩායමක් බවත් ඊට පසු ඔවුන් අයත් වන්නේ සතුන්ගේ කුලයට කියාය. Senior lecturer at the Department of Philosophy at the University of Peradeniya Dr. Charitha Herath, while commending the role played by parliamentary watchdog committees such as the Committee on Public Enterprises (COPE), charged that presidential commissions have been appointed solely for political reasons. Have the number of presidential commissions appointed in the recent past served any real purpose? These parliamentary standing committees are a continuous exercise throughout our country’s democratic history. I think they are making good progress, but these presidential commissions with specialised focuses are appointed with political aspirations – whoever it’s been. For example, the committee appointed to look at the late Sirimavo Bandaranaike’s political rights and similar commissions have been appointed for political purposes. The same thing happened when the new Government came into power in 2015 on a campaign of allegations against the former Government on various issues of corruption. They had to go and appoint presidential commissions to try and prove their allegations and fulfil their rhetoric. I think all these commissions have submitted various reports but no real progress has been made on their findings. 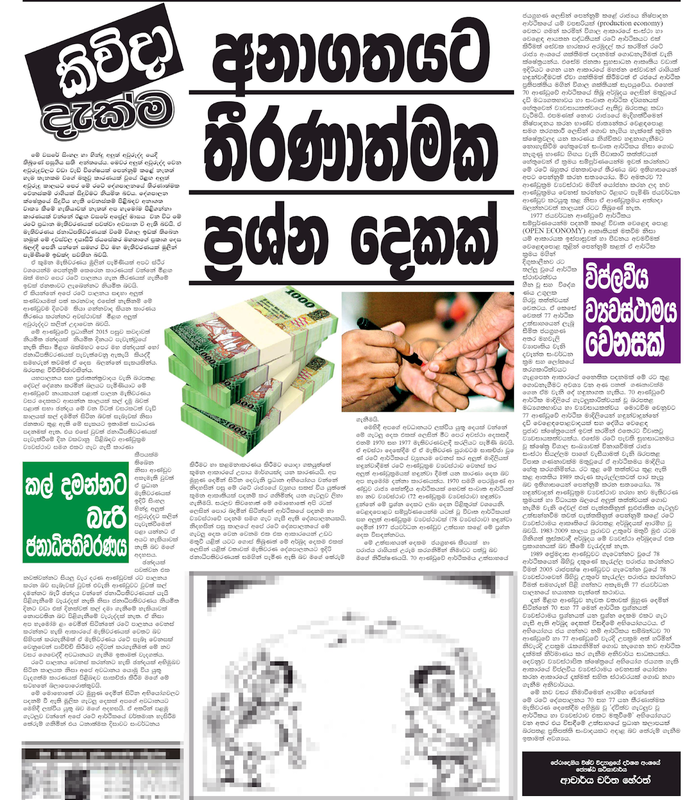 The Presidential Commission on the Central Bank Bond Scam, which was also appointed for political reasons, was also futile, because I don’t see how a commission appointed by the Government would really question the Prime Minister of that very same Government and prove his involvement in the scam. This is part of the political game played in this country. Any future government will also appoint more commissions and it will continue as it has so far. I know that some readers would wonder and probably would question my topic of this week’s column. As many would know very well that three personals that I use as my topic does not have anything in similar; their time, their thinking or in their respective countries of origination. 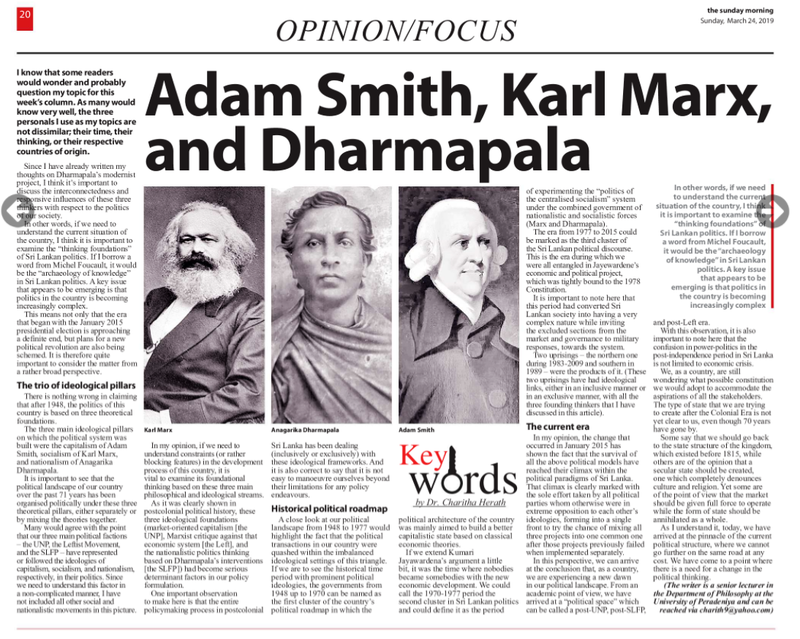 Since I have already written my thoughts on Dharmapala’s modernist project, I think it is important to discuss the interconnectedness and responsive influences of these three thinkers with respect to the politics of our society. 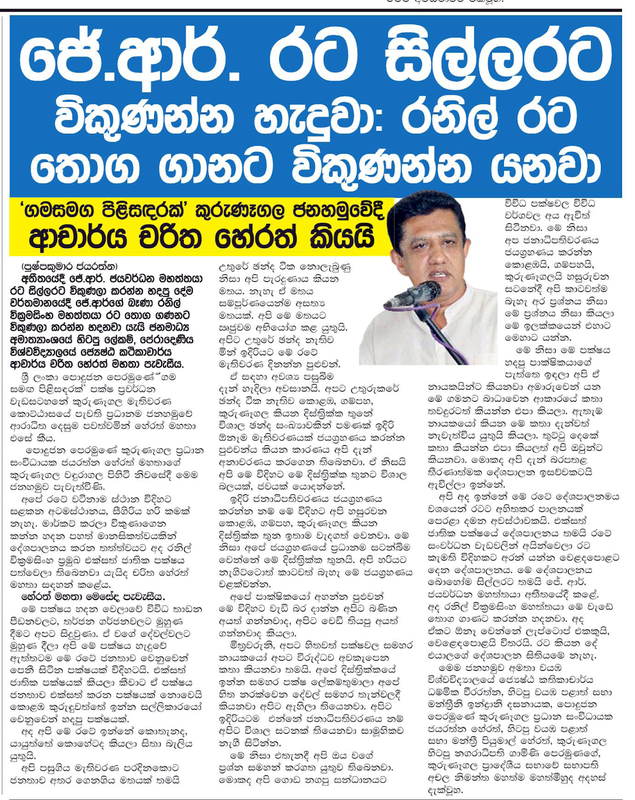 In other words, if we need to understand the current situation of the country, I think it is important to examine the ‘thinking foundations’ of Sri Lankan politics. If I borrow a word from Michel Foucault, it would be the ‘archeology of knowledge’ in Sri Lankan politics. A key issue that appears to be emerging is that politics in the country is becoming increasingly complex. This means that not only the era that began with the January 2015 presidential election is approaching a definite end, but plans for a new political revolution are also being schemed. It is therefore quite important to consider the matter in a rather broad point of view. There is nothing wrong in claiming that after 1948, the politics of this country is based on three theoretical foundations. 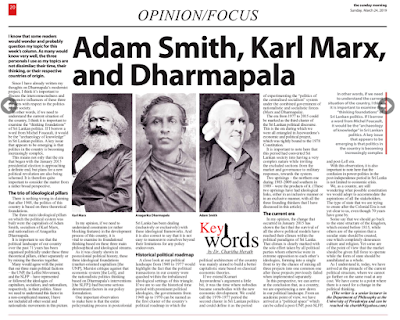 The three main ideological pillars on which the political system was built were Capitalism of Adam Smith, Socialism of Karl Marx and Nationalism of Anagarika Dharmapala. මේ රජයේ හතර වැනි අය-වැය ලේඛනය පාර්ලිමේන්තුවට ඉදිරිපත් කරනු ලැබුවේ පසුගිය සතියේය. රටේ ජනතාවගේ එච්චර අවධානයකට ලක්වුණේ නැති වුණත් මේ දවස්වල හැමදාම වාගේ අය-වැය විවාදය පාර්ලිමේන්තුව තුළ පැවැත්වෙන බව ද සත්‍යයක්ය. 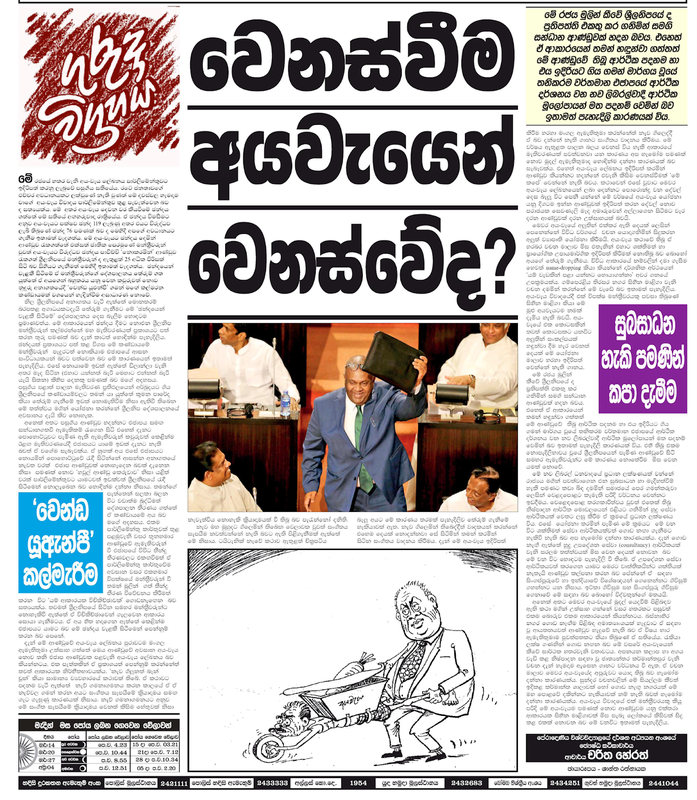 මේ අතර අය-වැය දෙවන වර කියවීමේ ඡන්දය ගත්තේ මේ සතියේ අඟහරුවාදා රාත්‍රියේය. ඒ ඡන්දය විමසීමට අනුව අය-වැයට පක්ෂව ඡන්ද 119 ලැබුණු අතර එයට විරුද්ධව ලැබී තිබුණේ ඡන්ද 76 පමණක් බව ද මෙහිදී අපගේ අවධානයට ගැනීම ඉතාමත් වැදගත්ය. මේ අය-වැයට ඡන්දය දෙමින් ආණ්ඩුව රැකගත්තේ එක්සත් ජාතික පෙරමුණේ මන්ත්‍රීවරුන් වුවත් අය-වැයට විරුද්ධව ඡන්දය පාවිච්චි ‘නොකරමින්’ ආණ්ඩුව රැකගත් ශ්‍රීලනිපයේ මන්ත්‍රීවරුන් ද ඇතුළත් 25 අධික පිරිසක් සිටි බව සිහියට ගැනීමත් මෙහිදී ඉතාමත් වැදගත්ය. ඡන්දයෙන් වැළකී සිටීමේ ඒ මන්ත්‍රීවරුන්ගේ දේශපාලනය තේරුම් ගත යුත්තේ ඒ අයගෙන් බහුතරය යනු වෙන කවුරුවත් නොව නුදුරු අනාගතයේදී ‘වෙන්ඩ යූඑන්පී’ ගමන් මඟේ කල්මරන කණ්ඩායමක් වශයෙන් හැඳින්වීම අසාධාරණ නොවේ. නිල ශ්‍රීලනිපයේ අනාගතය වැටී ඇත්තේ මොනතරම් බරපතළ අගාධයකටදැයි තේරුම් ගැනීමට මේ ‘ඡන්දයෙන් වැළකී සිටීමේ’ දේශපාලනය දෙස බැලීම හොඳටම ප්‍රමාණවත්ය. මේ ආකාරයෙන් ඡන්දය දීමට නොඑන ශ්‍රීලනිප මන්ත්‍රීවරුන් කල්මරන්නේ මහ මැතිවරණයක් ප්‍රකාශයට පත් කරන තුරු පමණක් බව දැන් කාටත් හොඳින්ම පැහැදිලිය. ඡන්දයක් ප්‍රකාශයට පත් කළ විගස මේ කණ්ඩායමේ මන්ත්‍රීවරුන් පැදුරටත් නොකියාම එජාපයේ ආසන සංවිධායකයන් බවට පත්වෙන බව මේ කාරණයෙන් ඉතාමත් පැහැදිලිය. එසේ නොයාමේ ඉඩක් ඇත්තේ ඩිලාන්ලා වැනි අතර මැද සිටින (එහාට යන්නත් බැරි මෙහාට එන්නත් බැරි යැයි සිතන) කිහිප දෙනකු පමණක් බව මගේ අදහසය. 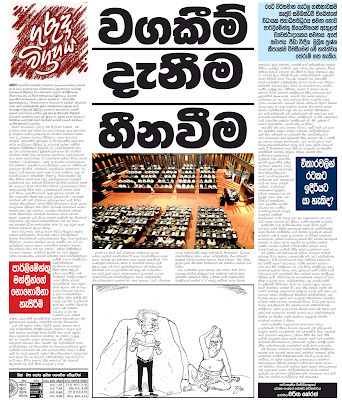 පසුගිය පළාත් පාලන මැතිවරණ ප්‍රතිඵලයෙන් අර්බුදයට ගිය ශ්‍රීලනිපයේ කණ්ඩායම්වලට තමන් යා යුත්තේ කුමන පාරේද කියා තේරුම් ගැනීමේ ඉඩක් නොමැතිවීම නිසා ඇතිවී තිබෙන මේ තත්ත්වය මගින් යෝජනා කරන්නේ ශ්‍රීලනිප දේශපාලනයේ අවසානය දැයි කිව නොහැක.